“Let kings stack their treasure houses ceiling-high, and merchants burst their vaults with hoarded coin, and fools envy them. I have a treasure that outvalues theirs. A diamond as big as a man’s skull. Twelve rubies each as big as the skull of a cat. Seventeen emeralds each as big as the skull of a mole. And certain rods of crystal and bars of orichalcum. Let Overlords swagger jewel-bedecked and queens load themselves with gems, and fools adore them. I have a treasure that will outlast theirs. A treasure house have I builded for it in the far southern forest, where the two hills hump double, like sleeping camels, a day’s ride beyond the village of Soreev. -Fritz Leiber, "The Jewels in the Forest"
So is anyone else hearing the rattle of dice and the call to adventure? I don't mean that in the pejorative sense of today; despite Lankhmar's wargame origins, I never have the inkling that Leiber is merely turning gaming sessions into stories. Rather, even in Fafhrd and the Gray Mouser's various moods and frenzies, their enthusiasm for adventure is infectious. It isn't just greed that compels them to search for Urgaan's treasure, as they realize that, nine times out of ten, the treasure won't be at the end of the map. People boast, and someone else might have beaten them to the goal in the centuries prior. but Fafhrd and the Gray Mouser search any way. It'll be fun. Who knows what sights they'll see? And, yes, a diamond as big as a man's skull will buy wine, wenches, and song in Lankhmar. These boys aren't plaster saints. I will pass on the summary this time. Leiber meters out information slowly. We meet his adventurers caught in an ambush well before the Gray Mouser reads Urgaan's challenge. Then we discover the identity of the ambushers, and that, thanks to the Gray Mouser's quick fingers, the ambushers do have a legitimate quarrel with Fafhrd and the Gray Mouser. Rather than front loading the action with these details, Leiber lets the Gray Mouser ponder each - after the ambush is routed, of course. It serves to establish the adventurers' priorities as adrenaline junkies and curiosity seekers, and it would be a shame to mar such a slow burn with the compactness required in a summary. Besides, this is a pulp treasure hunt. 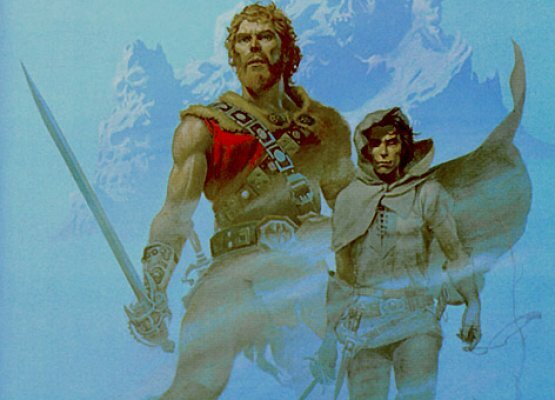 We know that Fafhrd and the Gray Mouser will find the treasure, but not yet what twists await their discovery. Seven foot tall Fafhrd is a barbarian from the snowy North, a fighter and a skald with a curiosity toward civilization, even if he sees the downside as well. He is an idealist, but with a strong tendency towards practicality that keeps him alive. The Gray Mouser is a wizard's apprentice-turned thief, dexterous enough to be a fencer or a stage magician. He is more cynical than Fahrd, but has a sentimental streak. Both are experienced professionals, knowing when to run or fight, and when discretion is the better part of valor. This experience keeps them alive after a second set of ambushes. However, practicality and sentiment allow them to escape the murderous traps at the end of "The Jewels in the Forest". Back when my first introduction to D&D was the Baldur's Gate video games, I wondered why the mages used slings. Thank the Gray Mouser for that, as he uses his sling to great effect in the fights here. Also, Discworld owes much to Lankhmar - Ankh-Morpork, the Thieves' Guild, and the recurring odd pairing of Cohen the Barbarian and Rincewind the Wizzard . Ah! Played Baldur's Gate a lot, but completely missed the link between the Gray Mouser and wizards with slings.